Sometimes a challenge can get the creative ideas flowing and a month or so ago my Saturday Morning class were set a challenge, to create a small piece of work, based on one of four pictures of places special to me. 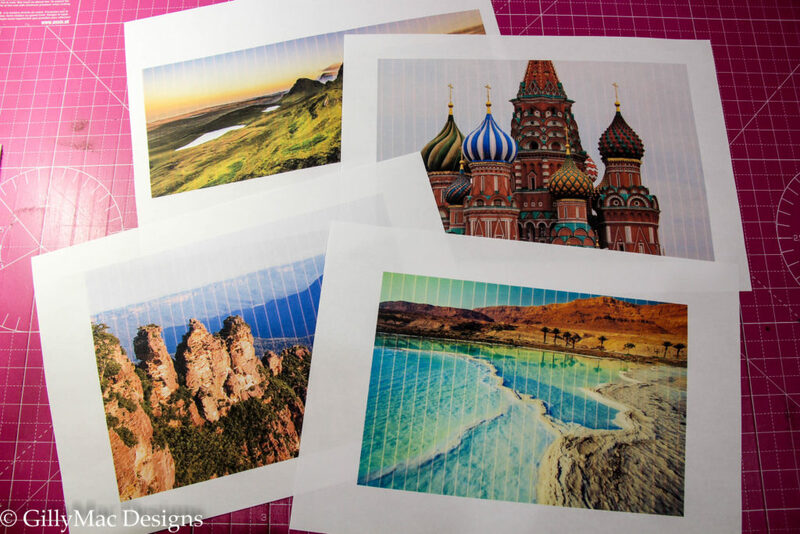 There were of St Basil’s Basilica in Red Square, the Isle of Skye, the Dead Sea in Israel or the Blue Mountains in Australia. All places I had visited for the first time in my teens or 20s that I just loved and still do. I wanted the girls to look at the colours and mood of the pictures, not necessarily the composition, and use small pieces of fabric to create a modern mini quilt top – about the size of a large placement. 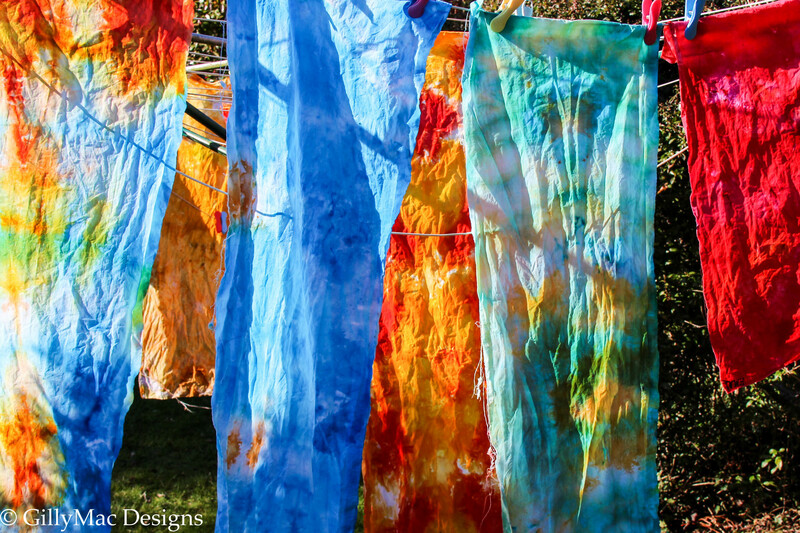 Using just plain fabric would be a good start, but to add to this, and give their mini quilts ‘movement’, we decided to give ice dyeing a go. Although I dye frequently for myself, I’d only ice-dyed once before – so it was an adventure for all of us! We started with fabric which had no manufacturing residues on it. If you give any fabric a good wash in a machine it should be fine. I like to used Egyptian cotton which has a high thread count and arrives ready for dyeing. There is no need to dye large pieces – in fact, the pieces we were dyeing were around fat quarter-ish size in area. I prepared a soda ash solution*, which is a fixing agent, ahead of time and let it cool. Each piece of fabric was soaked in the soda ash solution and wrung out. Then it was up to each individual how to arrange their piece. They could fold, pleat, scrunch, roll or twist their fabric pieces. We then secured the folded fabric with a couple of elastic bands. The fabric bundles were placed on a metal rack (I used a cooling rack) which was suspended over the sink. 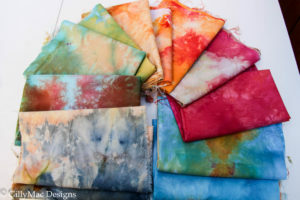 This is so that as the ice melts, the fabric isn’t sitting in a pool of mixed up dyes. The dye that isn’t soaked into the fabric just drips off the metal tray. over the ice. The colour of dyes was chosen on the basis of what we had and what fitted with the mood of the picture we would be working with. 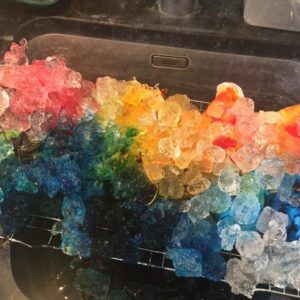 As there were 5 people dying 10 bits – all of which were on one rack – we expected some crossover of dyes as the ice melted – which was another element of excitement for us. Finally, we sprinkled 4 tablespoons of salt onto the ice. This was to help the dye fix into the fabric rather than wash away later. 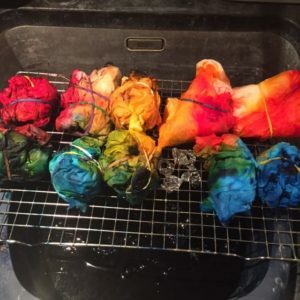 This was then left for 24 hours, for the ice to melt and the dye to settle into the fabric bundles, at the end of 24 hours, once again with gloves on, the bundles were unwrapped and rinsed in very hot water and placed in washing machine where they were all washed together on a quick 30 minute was with normal washing detergent. …. and…….this was the outcome. We were thrilled! Now the next stage could begin – they were going to start to compose their pieces! *I used 10 teaspoons of soda in 500ml of hot water. Be very careful when you dissolve the soda ash. Always wear gloves, do this in a well-ventilated room and do not inhale the gas that is generated. Just a few precautions and you will be fine. Always follow the soda ash manufacturers instructions to the letter. If you have any of this solution left afterwards, then store it in an airtight container, label the container (very important) and store it for the next time.